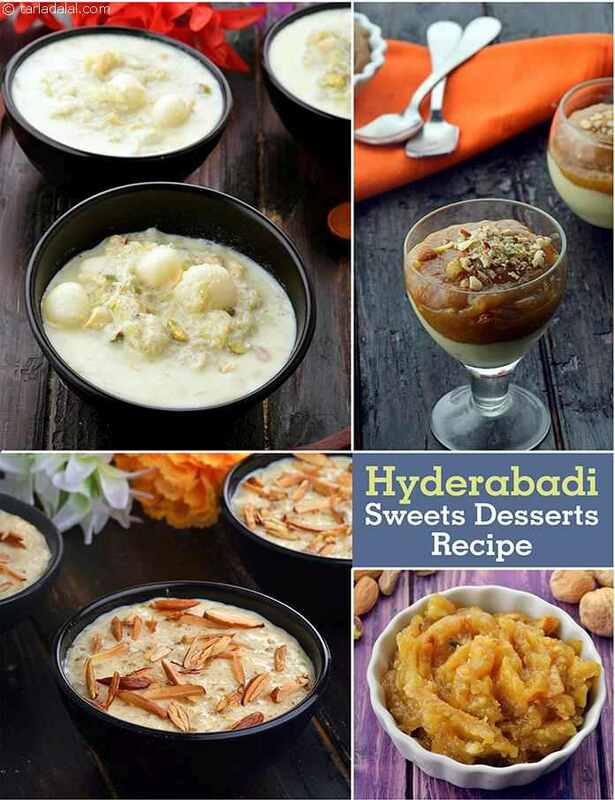 We have a collection of 10 Hyderabad Famous Sweets recipes which are a must try. An authentic sweet to relish after a sumptuous Hyderabadi meal is the Khubani ka Meetha. Tangy yet sweet apricots with a hint of cardamom and saffron is served on a bed of luscious, creamy custard. Garnish with mixed nuts to make it more rich. If you are not a fan of custard, then you can make the Khubani Halwa in a jiffy. The multi-flavours and multi-textures are a delight to the palate. Eid is incomplete without the authentic Sheer korma. Perked up with dry fruits like almond, cashewnuts, pistachios, raisins and dates, this sweet is delicious and satiating. Gil-e-Firdaus is a traditional Hyderabadi sweet made especially during festivals and weddings. Sabudana and crushed rice are cooked in milk and enhanced with an array of ingredients like bottle gourd, nuts, condensed milk and cashew paste to get a rich dessert. Similar to the famous Lauki (Doodhi ka Halwa) Halwa, the Hyderabadi Lauki Kheer with Mini Rasgullas is a unique sweet with a liquidy consistency and mini rasgullas. It is generally chilled and served at weddings and other grand functions. Double ka Meetha, in which the bread slices are dipped in a sugar-syrup and finally poured with the milk-mixture. Th milk is made with mawa which improves it’s texture giving a different mouth-feel. The Hyderabadi irani chai is incomplete without Hyderabadi Osmania Biscuit (saffron flavoured biscuit) and Karachi Biscuit (Tutti Fruti Biscuit). They even form great gifts to pick up and distribute among your friends and family. Enjoy our Hyderabad Famous Sweet Recipes and Hyderabadi Recipes articles below.